Bill Watson, born in Pine Falls in 1964, played junior for Prince Albert Raiders of the WHL and joined The University of Minnesota-Duluth for three seasons. In 1984-85 he scored 46 goals and added 60 assists for 109 points. This earned him the Hobey Baker Memorial Award as the outstanding player in US College hockey and first-team All-American honours for the second consecutive year. 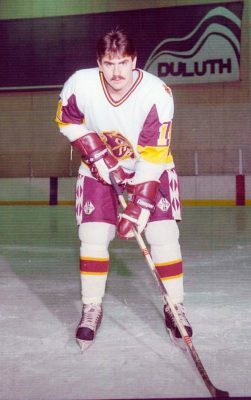 Watson passed up his final year of eligibility to sign with Chicago Black Hawks where he played 115 games. He was an assistant coach with his alma mater in 2010-11 when they were NCAA Division 1 national champs.